John rejoiced and eagerly ran to accomplish his shameful task. After a certain while, the Elder was commanded in a vision by the All-Pure and Most Holy Theotokos to allow Saint John to write again. 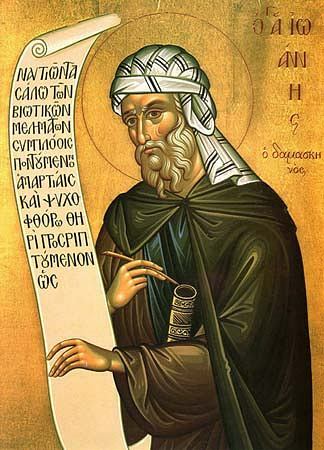 When the Patriarch of Jerusalem heard of Saint John, he ordained him priest and made him a preacher at his cathedral. But StJohn soon returned to the Lavra of Saint Sava, where he spent the rest of his life writing spiritual books and church hymns. He left the monastery only to denounce the iconoclasts at the Constantinople Council of 754. They subjected him to imprisonment and torture, but he endured everything, and through the mercy of God he remained alive. He died in about the year 780, more than 100 years old.